Combine the cheddar cheese, cayenne pepper, and ancho chile pepper in a small bowl and mix together. 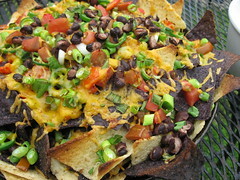 In a large cast iron skillet, 10 inches or larger, arrange a layer of assorted chips and top with 1/3 of each the tomatoes, scallions, black beans, cheddar cheese, and jalapeno peppers. Repeat with two more layers of chips and toppings. You may want to build a kind of “chip wall” around the outside edge of the skillet to keep toppings from tumbling off the sides. Place skillet on grill and heat for 10 – 12 minutes with the lid closed. Serve with sour cream. Makes 6 appetizer potions. Feel free to adjust the heat with more or less cayenne and ancho chile pepper; more sliced jalapeno; or seeded jalapeno. Pickled jalapenos work just fine too. Don’t be worried if the outside edges of some of the chips get brown and burnt. It just adds to the flavor and experience of Skillet Nachos.